Sasol is an international integrated chemicals and energy company. Through our talented people, we use selected technologies to safely and sustainably source, produce and market chemical and energy products competitively to create superior value for our customers, shareholders and other stakeholders. The company's Secunda Operations are the core of Sasol's Southern African Operations, producing a wide range of petroleum products including diesel, petrol and jet fuel, as well as chemical products which include ethylene, propylene and ammonia value chains. The operations contribute to job creation, sustainable development and security of supply in chemicals and energy. The site is host to the following entities: Sasol Mining, Secunda Synfuels Operations, Secunda Chemicals Operations, Sasol Energy and Group Technology. Sasol Mining operates ve coal mines in Mpumalanga that supply feedstock for the Secunda Synfuels Operations complex. The coal is mainly used as gasication feedstock and to generate electricity. Sasol Mining also exports coal from its Twistdraai Export Plant to international power generation customers. As some of these mines are approaching the end of their useful lives, new developments are underway to ensure continued supply through the company's Mine replacement programme. Secunda Synfuels Operations operates the world's largest coal-to-liquid manufacturing facility, producing synthesis gas (syngas) through coal gasication and natural gas reforming. The operating hub uses proprietary technology to convert syngas into synthetic fuel components, pipeline gas and feedstock for producing chemicals. Secunda Chemicals Operations is a large-scale integrated chemical product manufacturing facility that produces and adds further value to the Sasol chemicals value chains. Secunda Chemicals Operations also provides Sites Services, Infrastructure Maintenance and Product Logistics Services for the Secunda site. The Energy Business is key to Sasol's growth aspirations inside and outside South Africa, manages the marketing and sales of all Sasol’s oil, gas and electricity products in Southern Africa. Group Technology manages Sasol's research and development, technology innovation and management, engineering services and capital project management portfolios. The function contributes towards Sasol's fuels and chemicals businesses to maintain growth and sustainability through appropriate technological solutions and services. As an active corporate citizen, Sasol invests meaningfully in communities close to its operations with the main objective of sustainably contributing to the broader socioeconomic development of the Mpumalanga province as well as South Africa. For more information visit www.sasol.com. CONTENTS Mpumalanga Business 2018/19 Edition. Introduction Foreword6 A unique guide to business and investment in Mpumalanga. Mpumalanga Economic Growth Agency (MEGA) Driving trade and investment in Mpumalanga. Special features Regional overview  A new World Heritage Site will boost regional tourism. Mpumalanga’s major projects Mpumalanga’s mega projects aim to attract investors in a wide range of sectors. Economic sectors Agriculture and agri-processing Macadamia nut production is expanding every year. Mining33 The provincial government may start a mining company. Forestry and paper Sustainable resource management is a priority for timber companies. Oil and gas A natural gas pipeline runs to Mpumalanga’s Special Economic Zone. CONTENTS Water44 Nearly R2-billion is to be spent on bulk water and sanitation. Manufacturing48 Highveld steel works lives again as an industrial park. Transport and logistics The Moloto Corridor is a key regional route. Tourism52 A famous old bridge is the setting for the Kruger National Parkâ&#x20AC;&#x2122;s newest luxury accommodation. Banking and financial services All the major banks have agricultural divisions. Development finance and SMME support A small loan can make a big difference. Education and training The University of Mpumalanga is expanding. Government Mpumalanga Provincial Government An overview of the Mpumalanga provincial government departments. Mpumalanga Local Government An overview of Mpumalanga municipalities. ABOUT THE COVER: Credit: Sasol. The Sasol Octene plant. The Sasol complex at Secunda is one of the most significant features of the Mpumalanga economy. I’M AN ENTREPRENEUR. AN INNOVATOR. AND A GAME CHANGER. NOW I JUST NEED BIG VALUE FOR MY SMALL BUSINESS. You’ve got what it takes to succeed. All you need now is for your money to up its game for your business, with a business bundle from Nedbank. Save up to 40% on banking fees, get 35 free transactions a month, Greenbacks rewards, discount on your point-of-sale device, and a dedicated banker. All this and more for only R219 per month! For more information call 0860 116 400 or search ‘Business Bundle’ on nedbank.co.za. nedbank.co.za Terms and conditions apply. see money differently Nedbank Ltd Reg No 1951/000009/06. Authorised financial services and registered credit provider (NCRCP16). Mpumalanga Business A unique guide to business, investment and tourism in Mpumalanga. 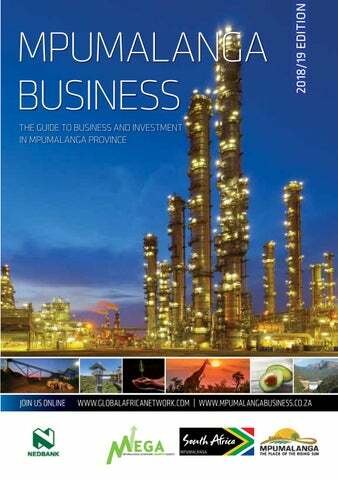 he 2018/19 edition of Mpumalanga Business is the ninth issue of this highly successful publication that since its launch in 2008 has established itself as the premier business and investment guide for the province. Mpumalanga has several investment and business opportunities in a wide range of sectors. In addition to the regular articles providing insight into each of the key economic sectors of the province, there are special features on major projects in Mpumalanga and informative articles on what incentives are available to investors and how to establish a business in South Africa. The Mpumalanga Economic Growth Agency (MEGA) outlines in this journal what lies in store for potential investors in the province. To complement the extensive local, national and international distribution of the print edition, the full content can also be viewed online at www.mpumalangabusiness.co.za. Updated information on Mpumalanga is also available through our monthly e-newsletter, which you can subscribe to online at www.gan.co.za, in addition to our complementary business-to-business titles that cover all nine provinces as well as our flagship South African Business title. DISTRIBUTION Mpumalanga Business is distributed internationally on outgoing and incoming trade missions; through the Mpumalanga Economic Growth Agency (MEGA); at top national and international events; through the offices of foreign representatives in South Africa; as well as nationally and regionally via chambers of commerce, tourism offices, trade and investment agencies, airport lounges, provincial government departments, municipalities and companies. Member of the Audit Bureau of Circulations COPYRIGHT | Mpumalanga Business is an independent publication published by Global Africa Network Media (Pty) Ltd. Full copyright to the publication vests with Global Africa Network Media (Pty) Ltd. No part of the publication may be reproduced in any form without the written permission of Global Africa Network Media (Pty) Ltd. . PHOTO CREDITS | Pictures supplied Anglo American Coal, Artographers/ Graskop Gorge Lift Company, Barberton Makhonjwa Mountains Lands World Heritage Site Project (BMML), Columbus Stainless, Chris Kirchoff/ Brand SA, Federale Stene, Highveld Industrial Park, MEGA, iStock, Raubex, Sasol, SA Tourism, Thebe Tourism Group, TWK Agri. DISCLAIMER | While the publisher, Global Africa Network Media (Pty) Ltd, has used all reasonable efforts to ensure that the information contained in Mpumalanga Business is accurate and up-to-date, the publishers make no representations as to the accuracy, quality, timeliness, or completeness of the information. Global Africa Network will not accept responsibility for any loss or damage suffered as a result of the use of or any reliance placed on such information. forward by the Mpumalanga Economic Growth Agency (MEGA). Mpumalanga hosted the 2017 National World Tourism Day in September, an event which was intended to move an already healthy economic sector into an even bigger creator of wealth and jobs. Heritage and cultural tourism are in the spotlight because Mpumalanga is already a leader in nature reserves and parks. There is a special focus on BRICS countries and provincial authorities are investigating a tourism airlift route between Moscow and Mpumalanga. Mpumalanga has rich and varied mineral resources and fertile soil that supports diverse farming operations. South Africa’s major power stations, three of which are the biggest in the southern hemisphere, are in Mpumalanga. The building of the new Kusile power station is one of the biggest infrastructure projects in the country’s history. minerals found in the province include gold, Platinum Group Metals, chromite, zinc, cobalt, copper, iron and manganese. The southern half of the eastern limb of the platinum-rich Bushveld Igneous Complex runs south towards the towns of Lydenburg and Machadodorp. Deposits of chromite, magnetite and vanadium in this area are the basis of the ferro-alloy complex in Witbank-Middelburg and Lydenburg. Nkomati Mine is South Africa’s only pure nickel operation. Minsk Tractor Works is one of the outcomes of this activity, and several agreements relating to training and trading have been signed. Russia, Belarus, China and Oman are some of the countries that Mpumalanga is engaged with. Overseeing infrastructure development in the province is the responsibility of the Department of Public Works Roads and Transport, which must ensure that various departmentsâ&#x20AC;&#x2122; projects are coordinated. When it comes to major projects, a new unit will be established in the Office of the Premier, the Provincial Project Management Unit. A large investment is being made on the railways that run to and through Mpumalanga. This includes upgrading the commuter railway linkages to the province from the province of neighbouring Gauteng and building new railway lines to transport coal through Swaziland and on to either Richards Bay or Maputo in Mozambique. Information and Communications Technology (ICT) is another form of infrastructure that has been receiving investment in recent times. A provincial ICT Strategy has been developed to coordinate and implement steps to improve ICT performance in the province. Columbus Stainless runs the only stainless-steel mill in Africa. SPECIAL FEATURE growing volumes. The Nelspruit district in the Lowveld is South Africa’s second-biggest producer of citrus fruit. The Graskop Gorge Lift Company has built a dramatic way to view the “Edge of the Lowveld” (pictured). Large parts of the province are in the so-called Middleveld comprising high-plateau grasslands. Forestry operations are found in central and southeastern Mpumalanga, but the heart of this important industry is around Sabie in the east. The Mpumalanga forestry sector is one of the most important in the country: 11% of the total land area of Mpumalanga is covered either by plantations or natural forests. Large sugar operations are found in the south-east of the province. The province has excellent roads and railway connections and is well served by airports, airstrips and heliports. The Kruger Mpumalanga International Airport and Hoedspruit Airport are the province’s two main airports. The Maputo Development Corridor is a transportation corridor comprising road, rail, border posts, port and terminal facilities, running from Pretoria in Gauteng through Mpumalanga to the Port of Maputo in Mozambique. The corridor supports high volumes of cross-border freight services. Industry and tourism benefit from the concentration of resources and ease of transportation. This international initiative emphasises Mpumalanga’s excellent location as a logistics and transport hub. The provincial economy is highly diverse with signicant activity in mining, agriculture, stainless-steel production, petrochemicals, pulp and paper, manufacturing and tourism. Mpumalanga's position and resources make it a valuable transport and logistics hub. In addition to good infrastructure, abundant natural resources and fertile soils, the province also boasts great scenic beauty, making it a desirable place in which to live and work. The Mpumalanga Economic Growth Agency (MEGA) facilitates investment in the province and is always keen to talk to potential investors. The Maputo Development Corridor (MDC) is a Spatial Development Initiative linking Gauteng, Mpumalanga, the Nkomazi SEZ and the Port of Maputo in Mozambique. The MDC incor­ porates road, rail, the SEZ, border posts, port and terminal facilities along one of the most industrialised strips in Southern Africa. The Nkomazi Special Economic Zone (SEZ) is positioned on the Maputo Development Corridor in the border town of Komatipoort (which straddles Mpumalanga Province and Mozambique). The longest part of the corridor runs through Mpumalanga Province. Infrastructure along the corridor has been upgraded and it provides investors and exporters with good access to the markets of East Africa, the Indian Ocean rim and East Asia. The MDC forms part of a greater transport axis that seeks to link the Atlantic and Indian oceans via Southern Africa and a network of corridors exists in the region. Other identified opportunities in the SEZ include mining services, mineral beneficiation, agro-processing (which could leverage the provincial citrus and sugar industries) and activities relating to import, distribution and local manufacture of automobiles. SEZs are a key initiative of the South African government and the Department of Trade and Industry (the dti) is making a package of tax incentives available to qualifying companies located in approved SEZs. The SEZ covers numerous opportunities for those with export-oriented businesses bonded warehouse, distribution centre, container yard, truck stop and petrol depot. MPUMALANGA ECONOMIC GROWTH AGENCY The Mpumalanga Economic Growth Agency (MEGA) is the official Economic Development Agency of the Provincial Government of Mpumalanga. The Maputo Development Corridor (MDC) is a Spatial Development Initiative linking Gauteng, Mpumalanga, the Nkomazi SEZ and the Port of Maputo in Mozambique. The MDC incorporates road, rail, the SEZ, border posts, port and terminal facilities along one of the most industrialised strips in Southern Africa. The longest part of the corridor runs through Mpumalanga Province. Infrastructure along the corridor has been upgraded and it provides investors and exporters with good access to the markets of East Africa, the Indian Ocean rim and East Asia. The MDC forms part of a greater transport axis that seeks to link the Atlantic and Indian oceans via Southern Africa and a network of corridors exists in the region. MEGA offers a range of services relating to trade promotion, investment, funding and property management. Funding MEGA funds SMMEs and businesses that specialise in agro-processing, mining, energy, manufac­ turing, construction, trade, transport, forestry, services, government and community. Preference is given to businesses owned by historically disadvantaged individuals. Our commitment MEGA is focused on customer needs and provides innovative solutions with a high level of service. Don't hesitate to make contact if you are inter­ ested in exploring some of the opportunities that Mpumalanga offers. The Mpumalanga Economic Growth Agency (MEGA) facilitates investment in the province and is always keen to talk to // potential investors. South African investment incentives The South African government, particularly the Department of Trade and Industry, has a range of incentives available to investors, existing companies, entrepreneurs and co-operatives across many sectors. example the Aquaculture Development and Enhancement Programme (ADEP), Clothing and Textile Competitiveness Improvement Programme (CTCIP) and the Tourism Support Programme (TSP). matching cash grant for registered primary co-operatives •	Sector Specific Assistance Scheme, which is a reimbursable 80:20 cost-sharing grant that can be applied for by export councils, joint action groups and industry associations. Manufacturing Incentives for SMMEs Key components of the incentive programme are the Manufacturing Incentive Programme (MIP) and the Manufacturing Competitiveness Enhancement Programme (MCEP). The initial MCEP, launched in 2012, was so successful that it was oversubscribed with almost 890 businesses receiving funding. A second phase of the programme was scheduled for launch in 2016. The grants are not handouts as the funding covers a maximum of 50% of the cost of the investment, with the remainder to be sourced elsewhere. The Enterprise Investment Programme (EIP) makes targeted grants to stimulate and promote investment, BEE and employment creation in the manufacturing and tourism sectors. Aimed at smaller companies, the maximum grant is R30-million. Specific tax deductions are permissible for larger companies investing in the manufacturing sector under Section 12i of the Income Tax Act. A lot of emphasis is placed on the potential role of small, medium and micro enterprises in job creation and a number of incentives are designed to promote the growth of these businesses. These include: •	Small Medium Enterprise Development Programme (SMEDP) •	Isivande Women’s Fund •	Seda Technology Programme (Stp). •	Seda is the Small Enterprise Development Agency, an agency of the Department of Small Business Development that exists to promote SMMEs. Trade-related incentives The Export Marketing and Investment Assistance (EMIA) Scheme includes support for local businesses that wish to market their businesses internationally to potential importers and investors. The scheme offers financial assistance to South Africans travelling or exhibiting abroad as well as for inbound potential buyers of South African goods. Establishing a business in SA South Africa has eased the barriers to doing business in South Africa for locals as well as international companies and individuals. Bank account A business bank account must be opened in the company’s name with a bank in South Africa. outh Africa has a sophisticated legal, regulatory and banking system. Setting up a business in South Africa is a relatively straight-forward process with assistance being offered by organisations such as the Department of Trade and Industry and provincial investment agencies like the Mpumalanga Economic Growth Agency (MEGA). South African law regulates the establishment and conduct of businesses throughout the country. Tax, investment incentives, regulations governing imports, exports and visas are uniform throughout the country. The particular environment varies from province to province with regard to the availability of human and natural resources, the infrastructure and support services, business opportunities and the quality of life. In this respect, MEGA can offer specific advice about the business environment in the province. Business is regulated by the Companies Act and the Close Corporation Act, which cover accounting and reporting requirements. Under new legislation, no new Close Corporations can be created but CCs can convert to companies. ified and do they have the relevant experience? Business permits Foreign nationals who wish to establish their own business or a partnership in South Africa must, apart from having sufficient funds to support themselves and their family, be able to invest at least R2.5-million in the business. The funds must originate overseas, be transferable to South Africa and belong to the applicant (ie emanate from the applicant’s own bank account). The business must also create jobs for South African citizens. After six months to a year, proof will have to be submitted that the business is employing South African citizens or permanent residents, excluding family members of the employer. Applications for work permits for self-employment can only be lodged at the South African Consulate or Embassy in the applicant’s country of origin. The processing fee is US$186. The applicant would also have to lodge a repatriation guarantee with the consulate/embassy equivalent to the price of a one-way flight from South Africa back to his or her country of origin. This guarantee is refundable once the applicant has either left South Africa permanently or obtained permanent residence. Any application for an extension of a business permit may be lodged locally. The processing fee per passport holder is R425. Some countries also need to pay R108 per return visa. A list of countries to which this applies is available from the Department of Home Affairs. MEGA assists investors in applying for the relevant work permits to conduct their business. Business entities There are a variety of forms which businesses can take, including private and public companies, personal liability companies, non-profit companies, state-owned companies and even branches of foreign companies (or external companies). Branches of foreign companies fall under Section 23 of the Companies Act of 2008 and are required to register as “external companies” with the CIPC. An external company is not required to appoint a local board of directors but must appoint a person resident in South Africa who is authorised to accept services of process and any notices served on the company. It must also appoint a registered local auditor and establish a registered office in South Africa. Patents, trademarks and copyrights Trademarks (including service marks) are valid for an initial period of 10 years and are renewable indefinitely for further 10-year periods. Patents are granted for 20 years, normally without an option to renew. The holder of a patent or trademark must pay an annual fee in order to preserve its validity. Patents and trademarks may be licensed but where this involves the payment of royalties to non-resident licensors, prior approval of the licensing agreement must be obtained from the dti. South Africa is a signatory to the Berne Copyright Convention. Permits for foreign nationals Work permits In considering whether or not to grant a work permit, the Department of Home Affairs will first evaluate the validity of the offer of employment by conducting a number of checks to confirm the following: •	Has the Department of Labour been contacted? •	Has the position been widely advertised? •	Is the prospective employer able to prove that he or she has tried to find a suitably qualified local employee prior to hiring a foreigner? What would MEGA do for you? MEGA will help new businesses by assisting in project appraisal and packaging, putting investors in touch with relevant agencies and government departments, alerting investors to investment incentives and setting up joint ventures where required. A full description of the services offered by MEGA is reflected elsewhere in this publication. Zoning in on fresh produce Mpumalanga’s mega-projects aim to attract investors in a wide range of sectors. fire the province’s many coal-fired power stations and underpin the ferro-alloy complex around Middelburg, where Columbus Stainless runs the only stainless-steel mill in Africa. SPECIAL FEATURE and Mozambique. The region is one of the most industrialised and productive areas in Southern Africa and the Maputo Development Corridor provides linkages west to the economic heartland of South Africa and eastwards to the ports of Mozambique. Proximity to the Mozambican port of Matola would support a dry port or logistics base. The SEZ focus is on infrastructure and manufacturing: transport, warehousing and logistics facilities, agri-processing, automotive support platforms and infrastructure to support companies operating in the mining and mineral sectors. Options for investors include bonded warehouses, a distribution centre, a container yard, truck stops and a petrol depot (with maintenance, fitment, and repair facilities). Other opportunities include phosphate for fertilisers, the production of ammonia and urea and the beneficiation of fluorspar for downstream agri-chemicals and fluorine production. Food processing and packaging for large retailers is another option. Potential products to be made include subtropical juice concentrate, lemon oil and lemon juice concentrate. Power stations like the Kendall Power Station produce fly ash as a byproduct. A beneficiation plant for fly ash is an investment opportunity. The projected increase in platinum and chrome output in the Steelpoort area at the border of Mpumalanga and Limpopo Provinces is putting increasing strain on road and rail infrastructure. To address infrastructure concerns, MEGA is now implementing the KUKA Steelpoort Ropeway Ore Transporting Project which will act as a means of transport of chrome and platinum ores from the mines to the smelters. The funding for all Ropeway Projects in Steelpoort area is likely to be between R50-million and R350-million. The cost for the Lion Ropeway Project is projected at R220-million. Aerial ropeways of over 100km long can be constructed, consisting of a series of sections linked by automatic transfer stations. The province attracts over onemillion tourists a year to the natural wonders of the Bourke’s Luck Potholes, God’s Window, the Blyde River Canyon and the Kruger National Park. MEGA is seeking investors to build an exclusive five-star hotel and top-quality restaurant located at the Bourke’s Luck Potholes on the Highveld part of Blyde River Canyon Nature Reserve. There are also innovative expansion plans for God’s Window, a famous lookout point on top of a 700m high cliff in the Drakensburg Mountains overlooking the Lowveld Escarpment – one of Africa’s prime wildlife and game reserves destinations. MEGA is planning to build a “Sky Walk” tourism attraction – an income generating, cantilevered glass walkway and viewing deck suspended off the edge of the God’s Window cliffs, giving 360° panoramic views out and 700 metres down through a glass floor. Mpumalanga Stainless Initiative Columbus Stainless supports MSI to beneficiate stainless steel. pumalanga Stainless Initiative (MSI) was established in 2001 and registered as a non-profit company on 24 December 1999. MSI is located in Middelburg, the home of stainless steel and just a few kilometres from Columbus Stainless (Pty) Ltd, Africa’s only producer of stainless steel flat products. MSI has entrenched itself as the only technology-based business incubator in the stainless steel sector that specialises in nurturing sustainable small and medium-sized enterprises (SMEs) through stainless steel. Columbus Steel has a vision of growing the economy through stainless steel beneficiation. This can be achieved through their mission of nurturing sustainable SMEs and using their values of product innovation, service excellence and integrity. MSI is predominately targeting unemployed, struggling or dormant stainless steel goods manufacturers who have work experience or are running their businesses in the informal sector. Assistance is also offered to graduates or entrepreneurs, who have experience in manufacturing or engineering of stainless steel finished products. One of the key objectives is also to assist people who have an interest in starting a business and have the potential to create employment opportunities for the community. Quality management and adherence to customer needs and ISO9001. Design management, ensuring compliance in terms of patents, trademarks and intellectual property (IP). Branding and helping to create public awareness and exposure for the product. Networking in terms of events, workshops and expos. The support generated through the partnership with Columbus Stainless (Pty) Ltd has allowed small businesses to be showcased in terms of procurement opportunities and support services. Solar drier manufactured by Madingoana Steel. Seen here is Jenny Nawa from Feed a Child feeding vegetables to be dried in the feeder. Product Stainless steel coaster sets, certificates and photo frames for Columbus’ long-service award function. Solar driers for Feed-A-Child. Laser-cut South America stainless steel map. Year-end gift steak pans for Columbus Stainless. Carrols Café balustrades and stainless steel artistic trees. Business card holders for Middelburg Chamber of Commerce and Industry banquet gift. The road ahead sees Columbus and MSI forging a Service Level Agreement in order to improve lead times and the quality of goods produced. MSI will also continue to lobby for more private sector involvement. Columbus and MSI urge all companies who have a need for stainless steel goods to involve MSI and have custom-made products made by SMEs. This will help to grow entrepreneurs, develop skills and create jobs in our community. Partners MSI is a member of the Southern African Stainless Steel Development Association (SASSDA) and the Southern African Technology Business Te c h n o l o g y Incubation Association (SABTIA). Department of Small Business Development (DSBD) via the Small Business Development Agency (Seda) through their Te c h n o l o g y Programme (STP) Mpumalanga Department of Economic Development and Tourism Steve Tshwete Local Municipality Columbus Stainless (Pty) Ltd.
Making it easier to do business with Nedbank Whole-view Business Banking™ Loderick Lubisi, Nedbank Provincial General Manager for Retail and Business Banking for Mpumalanga, explains how Nedbank can help business owners in the region. on what’s most important to you – running your business,’ says Lubisi. In line with our new brand proposition encouraging clients to see money differently, our Mpumalanga agriteams are committed to providing key support, as well as advisory and business services to all roleplayers involved in the agrispace in both provinces. We will share our financial expertise and play a role in advancing profitable, sustainable practices throughout the agricultural production and consumption value chain. We recognise that farmers today face many challenges and that to remain competitive they continually have to improve and adopt best practices and new technologies. the public sector, ensuring that such partnerships support provincial government goals in respect of job creation and growing the economy,’ Lubisi concludes. Should you be interested in taking your business to the next level, please call Loderick Lubisi on +27 (0)13 759 4910, send an email to loderickl@nedbank.co.za or visit www.nedbank.co.za. Nedbank Business Bundle is a game changer with savings and personalised services for small enterprises The new Business Bundle from Nedbank is a game changer for small enterprises in Mpumalanga, offering the best value for money when compared to rival offerings. Stella Tedeschi, Regional Manager of Broker Channels for Mpumalanga, says Nedbank Insurance is not a one-size-fits-all business. Nedbank Insurance has evolved into a business that provides integrated insurance to individual and business clients. Our offering comprises comprehensive short-term insurance solutions, life insurance solutions and investments. Nedbank Insurance provides a comprehensive offering of short-term products on behalf of blue-chip insurers. Should you be interested in expert advice on the type of cover that is exactly right for your business needs, look no further. Nedbank has a team of specialists ready to provide you with information necessary to allow you to make an informed decision. For more information call Stella Tedeschi on +27 (0)12 436 7659, send an email to stellat@nedbankinsurance.co.za, or visit www.nedbank.co.za. To see how Nedbank can help your small business reach its goals call Loderick Lubisi on +27 (0)13 759 4910, send an email to loderickl@nedbank.co.za or visit www.nedbank.co.za/business. Nedbank Ltd Reg No 1951/000009/06 Nedbank Ltd Reg No 1951/000009/06. Authorised financial Authorised financial and registered credit provider (NCRCP16). servicesservices and registered credit provider (NCRCP16). Agriculture and agri-processing Macadamia nut production is expanding every year. SECTOR INSIGHT Halls and Westfalia are two of South Africa’s biggest agri-businesses. Crops Macadamia nuts have grown in popularity exponentially in recent years. About 4 000 hectares of new trees is added each year across South Africa, with most of that in Mpumalanga and neighbouring Limpopo. The vast majority of the nuts are exported, with about 40% going to China. There are about 450 farmers growing the nuts and there are 14 cracking factories in South Africa. The sector employs about 4 500 people, of which 1 500 are permanent employees. Barberton and Hazyview are two prime areas for the nut. The Mpumalanga Economic Growth Agency, MEGA, has equity in Hi-Veld Fruit Packers and Tekwane Citrus. Mpumalanga produces one-million tons of maize from 291 788ha. About 53 000 tons of wheat and 33 000 tons of sorghum are produced annually. Soya bean is another major crop: more than half of South Africa’s soya bean crop is produced in Mpumalanga’s Highveld areas. Mpumalanga accounts for about 21% of South Africa’s citrus production and a third of its export volumes, with Valencias being the province’s most popular varietal and Nelspruit being the centre of the sector. Avocados, litchis, mangoes and bananas thrive in the province. Hazyview is an important source of bananas, with 20% of South Africa’s production originating in this district. Deciduous fruits are cultivated in smaller quantities. The village of Tonteldoos north of Dullstroom hosts an annual peach festival that includes liquid marvels such as peach mampoer. About 15 000 tons of table grapes are produced in the province annually and Mpumalanga produces its own wine. A specialist fruit that does well in the province is the marula. The marula fruit makes a popular beer and is used in the production of a liqueur that has done well on the international market. Potatoes and potato seed thrive in Mpumalanga’s fertile soil, with one operation in the higher reaches of the Drakensberg range producing more than 2 000 tons of seed every year. Tomatoes, onions and cabbage are also farmed profitably. Cotton is grown mostly under dryland conditions in Marble Hall. The province has 1 500ha of dryland under cotton. Much of South Africa’s total annual production of about 34-million kilograms of tobacco, especially Virginia tobacco, takes place in the north-western parts of Mpumalanga, and in neighbouring Limpopo. Other crops produced for export in Mpumalanga include cut flowers, pot plants and nursery plants. companies have large facilities in the StandertonVolksrust area. The town of Ermelo is the centre of one of the country’s most important sheep-farming districts. The province is home to one of South Africa’s largest pig farms, Kanhym, near Middelburg. Karan Beef has recently built a large abattoir in Balfour to service its massive feedlot in neighbouring Gauteng. Up to 1 800 head of cattle can be processed every day at the facility. three mills (including Pongola in northern KwaZulu-Natal) have been able to maintain volumes because of extensive irrigation schemes. The company was bought by RCL Foods in 2014. TSB Sugar has been increasing the amount of cane it takes from community trusts and small-scale growers. The proportion of land used to harvest cane from small-scale growers on community land has grown to 15%, with 64% coming from commercial farmers and community trusts and 21% from TSB’s own land. About 44 000ha in the province is under sugar cane. Commercial farmers account for 27 000ha, emerging farmers for 9 500ha and TSB Sugar has 7 800ha of its own. operations in the province. The group’s South African operations regularly sell more than five-million cartons of avocados (50% of the country’s export volume) and seven-million cartons of mangoes. Westfalia is a subsidiary of the Hans Merensky Group and most of its holdings are in the neighbouring province of Limpopo. Umbhaba Estates is one of the biggest banana growers in the province. The drier Highveld region with its cold winters supports crops such as cereals, legumes and nuts. There is extensive irrigation in the Loskop Dam area. Ermelo in the centre of the province is one of South Africa’s main centres of sheepfarming and wool-production. Standerton in the south-west is a dairy centre and Piet Retief in the south-east concentrates on sugar and tropical fruit. Subtropical fruit flourishes in the Lowveld with the town of Nelspruit being a major citrus producer. Mangoes, avocados, pecan and macadamia nuts, bananas and papayas also thrive. The Subtropical Fruit Growers’ Association represents about 400 avocado growers. Subtropical fruit altogether has a combined turnover of R950-million and employs about 13 000 people. Mixed farming and potatoes, sweet potatoes and beans are mostly found in the southern and western parts of the province. Between them, the highlying areas of Mpumalanga and the Free State account for 40% of South Africa’s potatoes. Mining The provincial government may start a mining company. Mafube coal mine is a JV between Anglo American Coal and Exxaro 30km west of Middelburg. Isibonelo Mine is located near Kriel. News Two hundred employees at Anglo American Coal’s Zibulo Colliery are walking around with devices that look like smartphones but might save their lives. Instead of returning to the surface to report problems, Wi-Fi is connecting miners and managers from underground to the surface, from above to below and between workers underground at different locations. Pan African Resources increased its gold production by more than a quarter in 2017 with the development of the Elikhulu Tailings Project at Evander. At a cost of R1.8-billion, the project reduces the average cost of the miner’s gold production and consolidates three tailings dumps into one centralised location. Increasingly sophisticated technology allows for more efficient extraction of remnants of gold from old dumps and the new processing plant will deal with more than a million tons of tailings. Anglo American has announced it intends narrowing its focus to diamonds, platinum and copper. The first big move came in April 2017 with the sale of Anglo’s thermal coal operations to Seriti, a black-owned company lead by Mike Teke, the outgoing president of the Chamber of Mines, recently rebranded as the Minerals Council South Africa. ferro-alloy complex in WitbankMiddelburg (in Nkangala District Municipality) and Lydenburg (Mashishing). Nkomati Mine is South Africa’s only pure-nickel operation. The province’s coalfields are in the south and west of the province. In terms of new mining legislation, mining licences now include a provision whereby some of the resources mined must be made available to local manufacturers. The idea behind the Mineral and Petroleum Resources Development Act is to boost the minerals beneficiation sector, which, it is believed, will increase employment levels and stimulate economic growth. Uncertainty in the steel sector has meant that the plans of the Mpumalanga Provincial Government to develop a Mining and Metals Technology Park have been put on hold. Coal Mpumalanga accounts for 83% of South Africa’s coal production and is the third-largest coal exporting region in the world. The coalfields of the province feed nearby power stations. The town of eMalahleni (Witbank), in Nkangala District Municipality, is at the centre of the coal industry. In 2015 nearly 30% of national power utility Eskom’s coal (33.3-million tons) was supplied by Exxaro. Exxaro’s purchase of Total Coal South Africa (TCSA) has significantly increased the diversified miner’s capacity and took to six the number of mines the company has in Mpumalanga. OVERVIEW Seriti comprises Masimong Group Holdings (Teke’s company), Community Investment Holdings Projects, Zungu Investments Company and Thebe Investment Corporation. Seriti paid R2.3-billion for the New Vaal, New Denmark and Kriel collieries (all of which are tied to Eskom delivery contracts), as well as four closed collieries. 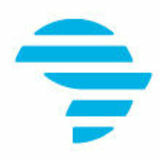 Seriti thus became the second-largest provider of thermal coal to Eskom, supplying almost a quarter of the utility’s annual coal requirements. State coal company AEMFC (African Exploration Mining & Finance Corporation) runs a colliery at Vlakfontein near Ogies and is planning to develop other projects. South32 (formerly BHP Billiton) has four collieries and three processing plants in the province. The company has 4 860 full-time employees and 4 400 contractors. Wescoal owns and manages the Khanyisa colliery which supplies the Eskom power station at Kendall with coal and it has acquired Keaton Energy. ArmCoal is a black-owned coal company that arose out of a deal between Xstrata Coal SA and African Rainbow Minerals Limited (51%). ArmCoal was the vehicle used in the creation of the large open-cut thermal coal mine at Goedgevonden. has purchased the Everest mine from Aquarius Platinum. Everest is adjacent to Northam’s existing Booysendal mine. Northam expects to produce 460 000 ounces of platinum group metals (PGM). A concentrator and a chrome extraction plant were included in the sale price of R450-million. Jubilee Platinum has sold its Smelting and Refining business in Middelburg to Siyanda Resources for R110.5-million. Sylvania Platinum now has seven PGM recovery plants that extract chrome from tailings on both sides of the Bushveld Igneous Complex. The company also has some shallow mining projects. Lydenburg is home to the Lion ferrochrome smelter that is a joint venture between Glencore and Merafe Resources. Feedstock is primarily provided by mines run by the same two companies, namely Magareng, Helena and Thorncliffe. Assmang, the joint venture between ARM Ferrous and the JSE-listed Assore, operates a chrome mine (Dwarsrivier) and a ferrochrome plant where chrome alloys are made. Reduced demand for stainless steel has meant that some of the furnaces at Machadodorp have shut down. The Manganese Metal Company (MMC) in Nelspruit is the largest producer of pure electrolytic manganese in the world. MMC is owned by Samancor (51%) and Bilston Investments owns the balance. uperfectca Trading is an electro-mechanical engineering company with a national footprint and a record of successful delivery of projects in all nine provinces. The company was founded in 2002 and has extensive experience in medium- and high-voltage products and related services. Superfecta manufactures high-tension products under the TMA brand and related services. TMA products include transformers, mini-substations and switchgear. Superfecta also employs a team of mechanical experts. The company prides itself on the supply, installation and maintenance of mechanical work and boasts over 14 years of experience in the mechanical field. Superfecta has strategically partnered with three internationally recognised companies: Thomas C. Wilson (New York), Schneider Electric (South Africa) and Jinshanmen Electrical Co. (China). The partnerships have enhanced our performance and enabled us to be the providers of the latest technology. Ownership Status 100% black-owned registered company, with 55% of the shares owned by women. strong partnerships and joint ventures with local and international entities that share our values and objectives. We have a full complement of highly skilled engineers, technical and administrative staff. All efforts are geared towards compliance with health and safety standards. Sectors Superfecta works in a variety of sectors, including but not limited to: • mining • provincial and local government • utilities • transport • oil and gas. testing machine, tube cleaners, vacuum leak dictator, tube cutters, expanding machine • Mechanical engineering (pipe fitting and rigging) • Steel pipe jacking and fitting, supply and install concrete jacks, jacks under roads and gas lines. All industrial concerns require a complex system of electrical networks to function efficiently and successfully. Superfecta both installs and conducts repairs to high tension electrical circuits. We also oversee electrical reticulation (urban and rural), electricity meters (prepaid and smart meters) and electricity works. Forestry and paper Sustainable resource management is a priority for timber companies. OVERVIEW forests. Sabie and Graskop represent the hub of the industry, but commercial forests are also found to the east and south along the Swaziland border. About 11% of the land mass is forested, with 4% of that being natural forest. The province is the national leader in total hectares under forest (514 000ha) and in export earnings. York Timbers owns and operates five processing plants, including the largest sawmill and plywood plants in South Africa, and it has 60 470 planted hectares. The company is considering investing in biomass energy generation. The Industrial Development Corporation (IDC) has a stake in York Timbers and a 42.6% share in Hans Merensky Holdings, a company with timber and processing interests in three provinces. Merensky is responsible for 20% of South Africa’s sawn pine lumber. The Mondi Group has extensive forestry holdings in the province and has been working on introducing a higher degree of mechanisation in its operations. Mondi has also instituted an ecosystem management plan throughout its forestry operations with the intention of better managing the impact its work has on the environment. Although local demand is dwindling, the export market for pulp and paper is strong. Pulp production figures have been on the rise for several years and companies like Mondi are increasingly focusing on pulp export because of better margins. Oil and gas A natural gas pipeline runs through Mpumalangaâ&#x20AC;&#x2122;s Special Economic Zone. SECTOR INSIGHT National government is setting new gas policies. The major economic sectors using gas are the metals sector and the chemicals, pulp and paper sector. Brick and glass manufacturers are also big consumers. Transnet Pipelines runs a 3 800km network of underground, high-pressure petroleum and gas pipelines throughout the eastern parts of South Africa. The companyâ&#x20AC;&#x2122;s sophisticated new multi-product pipeline (NMPP) between the coast and Gauteng brings a range of products to the manufacturing heartland of South Africa. OVERVIEW International chemicals and energy company Sasol has several large plants in Mpumalanga and plays a major role in the economy of Mpumalanga. In Mpumalanga Sasol’s assets are Sasol Mining, Secunda Synfuels Operations, Secunda Chemicals Operations and Sasol Energy. Products manufactured at the Secunda complex (pictured) include petroleum, paraffin, jet fuel, creosote, bitumen, diesel and lubricants. Gas by-products include oxygen and acetylene, liquefied petroleum gas (LPG), and hydrogen and nitrogen. The primary feedstock for synthetic-fuel production is coal, and the plant is in the heart of Mpumalanga’s coalfield region. Sasol is spending about R12-billion on expanding the capacity of the synfuels plant and on installing an oxygen plant and more Sasol Advanced Synfuel (SAS) reactors to convert gas feedstock to liquid fuel. Sasol Gas is one of the four Sasol operations at Secunda, supplying natural gas to Sasol Synfuels and buying Sasol Synfuels’ methane-rich pipeline gas to sell to customers in Mpumalanga and KwaZulu-Natal. Natural gas is an inexpensive alternative to coal. Although the coal industry still has life in it (old fields are being rehabilitated and new ones created – Sasol is itself spending R15-billion on opening three) it is a finite resource. Sasol will also likely be a key player when national government delivers its new policy on the biofuel ethanol industry. Statutory minimums for biodiesel in diesel and bioethanol in ethanol will give certainty to producers and boost production levels across the country. Sasol is already making 285 000kl of absolute alcohol in ethanol from sugar fermentation annually at Secunda. The company’s sophisticated technology for deriving liquids and gasses from coal can easily be converted to biomass sources such as sugar. Exploration Sasol and the provincial government have commissioned an in-depth technical feasibility study for a Petrochemical Technology Park to be located in the province. Water Nearly R2-billion is to be spent on bulk water and sanitation. SECTOR INSIGHT Rain harvesting is at the centre of a job-creation initiative. Water taking over its operations. The area of supply covers Bushbuckridge and Mbombela (Ehlanzeni District Municipality) which has 15 water treatment works, with a capacity of 245mâ&#x201E;&#x201C;/day. Water is supplied to 1.5-million people in the areas. The water treatment works include three large works (Inyaka, Hoxani and Kanyamazane) and several smaller treatment works (Thulamahashe, Acornhoek and Edinburgh) supply local communities with drinking water. OVERVIEW Expenditure in Bushbuckridge and Mbombela over the period 20152020 is expected to be R600-million. This is part of a broader national strategy whereby bigger boards such as Rand Water are growing their footprint, replacing the smaller local boards which lack the skills or resources to carry out their mandate. Rand Water, which historically served greater Johannesburg, now serves an area which includes Gauteng, Limpopo (Greater Groblersdal and Great Mable Hall), North West (Rustenburg and Madibeng areas), Mpumalanga and the Northern Free State (boundary of the Upper Vaal Water Management Area). The national Minister of Water and Sanitation is the shareholder, representing the government of South Africa. The Komati Basin Water Authority (KOBWA) is an important agency in controlling water resources in the region. Formed out of a cooperation agreement between South African and Swaziland, the agency has built two large dams and is responsible for their upkeep. In terms of the National Water Resource Strategy, catchment area management agencies have been established to oversee water resource management on a regional basis. The National Water Act stipulates that water resource management functions, excluding those that have national and strategic implications, will be carried out by CMAs. The Imkomati-Usuthu Catchment Management Agency covers Mpumalanga, parts of Limpopo and part of the Kingdom of Swaziland and is responsible for water usage issues relating to the following river catchment areas: Sabie-Sand, Crocodile, Komati, Nwaswitsontso and Nwanedzi. Among the responsibilities of a CMA are checking that water is being used lawfully, allocating resources to parties along a river (farmers, municipalities or businesses), long-term planning, dam safety and checking on the quality of water. The small town of Wilge on the western edge of Mpumalanga near the border with Gauteng will soon be receiving water from Eskom’s Kendal Power Station. The utility’s scientists aim to use chlorine dioxide rather than chlorine gas to produce potable water. Tests have shown that the treated water has a better colour and the water meets the standards set down by the South African Bureau of Standards (SABS). Komati Basin Water Authority Celebrating over 25 years of excellence in trans-boundary water management. PROFILE to accommodate professionals and technicians working at the dam site during the construction of the Driekoppies Dam. When these dams were built, households were successfully relocated and resettled. involvement of stakeholders of both countries to enhance and strengthen stakeholder relationship between the two countries. In future, KOBWA is looking forward to sustainable trans-boundary water resources development and management for water security for the two countries and the entire region, as water is life. Manufacturing Highveld steel works lives again as an industrial park. OVERVIEW company has two propylene manufacturing plants and recently completed two major investments aimed at improving flows and expanding production. This was done in two phases from 2012. Propylene is an input for polypropylene which is used in packaging, automotive components and textiles. The market is growing in South Africa at 4% per annum, roughly the same rate as the global market. of pure electrolytic manganese metal in the world. Delta EMD, in the same town, is one of the biggest producers of electrolytic manganese dioxide, a material used in the manufacture of alkaline batteries. Transport and logistics The Moloto Corridor is a key regional route. SECTOR INSIGHT The Mpumalanga International Fresh Produce Market offers many logistics opportunities. Africa’s road network. The plan to upgrade the corridor is one of 18 national Strategic Infrastructure Projects (SIPs). Not only will the corridor provide better linkages between the provinces and boost development along the route but improve access to the mineral reserves of the Waterberg region. The Maputo Development Corridor is Africa’s most advanced spatial development initiative (SDI) comprising road and rail infrastructure, border posts, and port and terminal facilities. Run by the Maputo Development Corridor Logistics Initiative (MCLI), the corridor runs from just outside Pretoria in Gauteng, through Witbank, Middelburg and Nelspruit in Mpumalanga, and on to Maputo in Mozambique. The already successful Maputo Development Corridor will soon receive a further boost with the upgrading of the Komatiepoort Dry Port into a Special Economic Zone. The National Department of Trade and Industry (dti) has designated the Mpumalanga Economic Growth Agency (MEGA) as the lead agent to develop the SEZ. OVERVIEW Another infrastructural development that will boost trade is Transnet’s Swaziland Rail Link (SwaziLink) project. A 146km railway line between Lothair in Mpumalanga and Sidvokodvo in Swaziland will allow for better movement of freight between the countries and provide a possible alternative route for freight through to Richards Bay. Fresh produce The road and rail networks of the province carry large volumes of coal and delicate fruits and vegetables for export. This is set to grow exponentially as the Mpumalanga International Fresh Produce Market (MIFPM) within the SEZ expands capacity. The groundwork has been done for the market and services are being installed. Private partners are being consulted to provide cold storage, packaging and warehouse facilities and agri-processing plants to convert the province’s many fruits and vegetable products into juices, jams and soups. Logistics will form a major part of the MIFPM offering, especially given the strategic location of the SEZ. The Mpumalanga rail system generates more freight traffic than any other province in South Africa and is of great strategic value. Transnet Freight Rail is the main operator and the chief freight movements are coal, fuel, chemicals, timber, iron and chrome ore, fruit, maize, animal feed, wholesale and retail goods, steel, building supplies, fertiliser and consumer goods. The port of Maputo in Mozambique is an attractive option for freight. The coal terminal at Richards Bay in KwaZulu-Natal receives the majority of the coal that is mined in the province. A new rail siding is being built to service the Majuba Power Station. The 68km single heavy-haul track will be a private line that is projected to cost in the region of R5-billion and create between 3 500 and 5 000 jobs. Private rail operators Sheltam service the coal-mining and ferrochrome-metal industries from regional headquarters in Witbank. The company runs systems, hauls raw materials and rebuilds and refurbishes locomotives. A grader in action at Komatipoort. Tourism A famous old bridge is the setting for the Kruger National Park’s newest luxury accommodation. OVERVIEW superb tourism assets, ranging from the iconic Kruger National Park (one of about 70 parks and reserves) to bird-watching, music festivals, car rallies and casinos. The provincial investment agency, MEGA, has packaged many tourism investment opportunities. The underlying principle in each case is a form of public-private partnership where the agency would assist in getting land-use and other legal requirements, and perhaps in seeing that basic infrastructure was laid on, then the developer would build and manage a tourism facility. A transaction adviser has been appointed to flesh out these proposals for investable tourism products. An example of infrastructure investment from the government’s side is the upgrading of the Manyeleti Resort, which is ongoing. Other provincial plans regarding tourism involve promoting the province as a convention venue (a Convention Bureau has been established and the City of Mbombela is being encouraged to build a large centre), adopting a strategy to attract international air links and promoting links with foreign tourism authorities. On the final point, Mpumalanga has started a partnership with the Ural Association of Tourism in Russia whereby 10 tour operators from Mpumalanga visited Yekaterinburg and a delegation from the Sverdlovsk region visited the province. Banking and financial services All the major banks have agricultural divisions. Agricultural financing is a growing sector. as agriculture and agri-processing), commercial, supply chain and manufacturing. It also offers training and technical support and funding to help businesses to comply with legislation. Development finance and SMME support A small loan can make a big difference. SECTOR INSIGHT Several new banking licences are in the pipeline. OVERVIEW R600-million on procuring goods and supplies from broad-basedblack-economic-empowered companies, of which R51-million will go to SMMEs. Other companies supporting SMMEs through their buying chain include Woolworths and Anglo American. Woolworths is funding TechnoServe to ensure that small tomato growers can grow produce that will meet the demanding standards of the retailer, and to help them expand production. A regular supplier to Woolworths, Qutom, assists with the project. Provincial government The Mpumalanga Economic Growth Agency (MEGA) is the implementing agent of the provincial governmentâ&#x20AC;&#x2122;s SMME support policy. An agreement has been signed by Standard Bank and MEGA to launch an SME Fund with a capitalisation of R500-million. In addition to a general commitment from the provincial government to purchase from SMMEs, township enterprises or co-operatives where possible, MEGA has received loan applications for R72.7-million. Rural enterprises feature strongly in the loan book profile, and there is significant support for women and youth-owned businesses. MEGA has also overseen the rehabilitation of industrial premises in former homelands and formed partnerships with financial institutions for funding. A Social Enterprise Model is being introduced to try to link small enterprises with infrastructure projects. Planners want to see local businesses building the roads and public buildings in the areas where those facilities are sited. MEGA has been allocated R10-million to assist SMMEs and co-operatives to make the most of opportunities that this model will create. The construction sector has huge potential for SMMEs, with products such as bricks, doors, tiles, trusses, concrete pipes and similar products providing opportunities for growth. Research is being conducted on the agricultural or manufacturing sectors across the province to guide future interventions to support SMMEs and co-operatives. Education and training The University of Mpumalanga is expanding. SECTOR INSIGHT The Colliery Training College has won a national award. • T h e U ni v er si t y o f Mpumalanga will spend R600-million per year on new buildings. Many of the biggest investors in the province support education initiatives. These include Sappi’s donation of several classrooms to Khanyisile Primary School near Barberton and programmes for pupils and teachers at Entabamhlophe Combined School in Elandshoek near the company’s mill at Ngodwana. More than 800 000 pupils in primary and secondary schools are beneficiaries of the provincial department of education’s school nutrition programme and 1 604 schools in the province are in the ‘‘no-fee school’’ category. Bursaries Several big employers in Mpumalanga support further education through bursaries. Sasol offers an all-inclusive bursary for students in engineering, science and accounting. The bursary also has performance-based awards and allowances for things like laptops and calculators. Top performers are often asked to join Sasol. OVERVIEW Sasol has also committed to taking on qualified apprentices from the Hydra Arc academy in Secunda, another reputable training centre. Four-year bursaries at 10 institutions of higher learning have been provided to 60 Mpumalanga students by Eskom and GE Steam Power. The R30-million scheme is focussed on technicians, scientists and engineers. The provincial government intends increasing from R200-million that it currently spends on tertiary bursaries. In 2018 there were 1 017 recipients studying across South Africa with a further 100 studying medicine, veterinary science, education (maths and science) and engineering in Russia. An inter-departmental Bursary Committee, with input from private companies, will be formed to ensure that the best candidates are selected and properly supported. Training The signing of a treaty with the Belarus region of Mogilev means that Mpumalanga students will study at the Belarussian State Agricultural Academy in agri-industry fields such as agronomy, biotechnology and aquaculture. An agreement between MEGA and Minsk Tractor Works to build an assembly plant in Mpumalanga will not only mean work and income, but it will also create opportunities for training. Mpumalanga has three Technical and Vocational Education and Training (TVET) Colleges, with an enrolment of over 36 000. UNISA, the Tshwane University of Technology and the Vaal University of Technology also have satellite campuses in the province. The three TVET colleges are: Gert Sibande (four campuses and a skills academy), Nkangala and Ehlanzeni, which has six campuses, a skills centre and a satellite campus. Ehlanzeni TVET College offers 10 National Certificate (Vocational) programmes including ICT, Finance, Economics and Accounting, Engineering and Related Design, and Tourism. Several shorter skills courses are offered: automotive repairs and maintenance, computer practice, entrepreneurship, municipal administration and communications management. Advocating for a just economic society The Provincial Secretary of the Black Management Forum Mpumalanga, Mawela Ndlamlenze, explains how a transformation master plan has been created. Please outline the main objectives of the Black Management Forum. The forum is committed to advocate for a just economic society for the collective advancement of primarily black people in the social and economic mainstream including: •	to train and develop primarily black professionals to be effective business and management leaders •	to ensure appropriate recruitment and advancement of black people into business organisations to achieve an equitable dispensation •	to link public, private and academic institutions into an effective network to support interdisciplinary communications, management innovation and professional development among black people •	to encourage professionals to play an active role in the broader South African community by participating in community outreach. What is your current focus? BMF Mpumalanga is focusing on corporate social investment by companies in local communities; business skills development through relationships with private organisations and state organs; mentorship; creating dialogue platforms through events that cover pertinent social issues; and canvassing for employment for our members, especially in senior positions within the private sector. BIOGRAPHY Mawela Ndlamlenze is from Ermelo and has a qualification within the Internal Audit profession. He works in the Risk Management Section of the Govan Mbeki Municipality where he also serves on the Audit Committee and the Risk Management Committee. Having served various non-profit organisations, Mawela has various business initiatives under his company Wishful Dreams Investment. What are some of the challenges facing business in Mpumalanga? The challenges our members face are access to market, access to funding, government legislation not being favourable to SMMEs and private policy that is structured in a way to disempower SMMEs. What are some of your most recent achievements? The recent achievement for BMF Mpumalanga is the facilitation between the BMF, civil society, labour unions and government in the development of the transformation master plan which seeks to outline key deliverables for transformation. How is the relationship between the BMF and civil society, labour unions and government? We are reviving and strengthening all these relationships, including the alignment with other black professional bodies. With Whole-view Business Banking™ from Nedbank, there’s one bank with one view across your business, allowing us to create unique business and financial solutions together. You’ll get partnership advice from a dedicated local client service team, supported by a team of specialists. By having the full picture we’ll have a deeper understanding of your business, which will take it further than ever before. Sometimes, a change in approach can change everything. Partner with Nedbank today. Search Whole-view Business Banking or email business@nedbank.co.za.